Thailand is abundant with so many natural wonders I’d be hard pressed to pick a favorite, but this year I stumbled upon one that definitely lingers somewhere near the top. I traveled to Khao Yai National Park, as so many others do, in search of elephants. One of the largest wild populations in Thailand calls Khao Yai their home, but they aren’t the only creatures the wildlife paparazzi goes gaga for! Other popular species in the park include gibbons, macaques, tigers, bears, leopards, guar, pythons and more. Founded in 1962, Khao Yai National Park was Thailand’s first, one of one hundred and twenty-seven National Parks that now grace the country. It’s also the most visited, and consistently rated as one of the best in Asia. At three times the size of Singapore, Khao Yai National Park is still only the second largest in Thailand after Kaeng Krachan! At 2,376 square miles (6,155 square kilometers) it dwarfs tiny Koh Tao, the 13 square mile (33 square kilometer) island that I call home in Thailand. The size is reflected in the name — ‘khao’ is Thai for hill and ‘yai’ translates to big. Therefore, Khao Yai means big hills. I visited Khao Yai National Park in January of 2016 with four friends — you can read about my experience here and here. It turned out to be a logistically difficult trip to coordinate. According to several sources, over 95% of visitors to the park are Thai nationals, many with their own transportation, leaving both English language information and tourism infrastructure limited. I read guidebooks, I scoured message boards and blogs, and I took pages and pages of notes about my own trip in order to create what I hope will be the most comprehensive guide on the internet to planning your own trip to Khao Yai National Park, independently or otherwise! It’s long, but it’s detailed – and if you’ve done this trip too, I’d love to hear from you in the comments to make this an even more valuable resource to other travelers. The National Park’s official website has limited English advice, and many of the sites that do have plenty of helpful details also sell tours to the park, thus don’t have much incentive to provide information on visiting independently. That said, many of the staff at the Visitor Center speak fantastic English, and can be reached at +66 08 6092 6529. Khao Yai’s gates are open from 6am to 6pm, though you can exit after 6pm if you stay in the park for a night safari. Haew Narok and Haew Suwat waterfalls close at 5pm. Park restaurants also close at 6pm, making it important to plan meal times carefully. The Visitor Center, however, is open from 8am to 9pm. You must pay both the personal entry and the entry for whatever vehicle you arrive on (unless, of course, you arrive by foot). If you have a Thai work permit, education visa or driver’s license you may be able to pay the Thai price, but don’t count on it – it seems it depends on who is at the gate that morning. Most sources claim that you cannot leave and re-enter the park without paying the entrance fee again. However I did read at least one account of a traveler being able to leave the park to eat outside and return on the same day without paying the fee twice. While I can’t vouch for it myself, it appears that you may be able to exit and return freely within the same day. You cannot, however, visit the park, leave to sleep outside it, and return the next day on the same ticket. Khao Yai National Park has both a southern and northern entrance. While the southern entrance in Prachin Buri Province is technically closer to Bangkok, it is very far from the Visitor Center and campsites, and due to the lack of transportation and services it is very seldom used by international travelers — see an overall map of the area here. This guide will exclusively reference the northern entrance in Nakhon Ratchasima Province, as my personal attempts to coordinate a trip from the southern entrance went in circles. Pak Chong is the gateway city to the park, 12.5 mile (20km) north of the northern entrance. There are several options for getting there — see a rough map of Pak Chong here. We arrived in Pak Chong via an afternoon ferry from Koh Tao to Chumphon, followed by a train to Bangkok’s Hualampung Station, followed by a train to Pak Chong. On the way back to Bangkok, we took a government bus to Bangkok’s Mo Chit Bus Terminal. You can reach Pak Chong by train from Bangkok, Ayutthaya, and Khorat (the nickname for Nakhon Ratchasima town), among other destinations. See a full map of Thailand’s rail connections here. While planning this trip, I frequently read to skip the train to and from Pak Chong as buses were faster and more efficient, and trains are often delayed. But I adore train travel in Thailand, and thus was determined to try it on this journey. There are ten trains a day from Bangkok to Pak Chong, many of which stop in Ayutthaya – one of the few destinations from which you will not have to connect through Bangkok in order to reach Pak Chong. You can also depart straight from the train station at Don Muang Airport, if you are connecting from a domestic flight within Thailand. There are ten departures a day from Bangkok to Pak Chong, with the longest listed journey time at about four and a half hours, and the shortest at just over three. Most trains leave their departure city on time and slowly become more and more delayed throughout their route. So an early morning train originating in Bangkok is likely to leave and perhaps even arrive on time (ours did). If you are coming from the South of Thailand, I highly recommend the route we took: Train 174 Rapid Service to Bangkok, departing Chumphon at 7:36pm and arriving at Hualamphong Station at 5:10am. I always sleep surprisingly well in the bunks! When we arrived in Bangkok, we had just enough time to hop onto Train 21 Special Express to Pak Chong, the first and fastest train of the day departing at 5:45am and arriving at 8:52am. Many overnight trains coming from Chiang Mai and other areas in the north will also be able to transfer to Train 21 to Pak Chong as well. For current schedules and prices, reference the State Railway of Thailand website or call +66 02 223 7010. Schedules as of August 2016 from Hualamphong to Bangkok can be found here, from Don Muang can be found here, from Khorat can be found here, and from Ayuthaya can be found here. There are no left luggage facilities at the Pak Chong Train Station, though there is at Bangkok’s Hualamphong. There is no central bus station in Pak Chong, though there is frequent bus and minibus service to both Bangkok (2h30) and Khorat (1h). Allegedly there are minibuses to and from Lopburi (2h) and Ayutthaya (2h30), but I was unable to find reliable information about these routes. Public buses from Bangkok’s Mo Chit Bus Station depart every twenty minutes or so from 4am to 8pm, taking about three hours. Just show up and ask when the next bus is leaving, as there are multiple companies that run this route. Departing Pak Chong, you can catch buses back to Bangkok from multiple bus terminals. One is located on Mittraphap Road, Pak Chong’s main drag, across from the giraffe statue. We paid 137 baht each for a first class bus to Bangkok’s Mo Chit Bus Station from here. Tickets to Khorat were also for sale. Another bus station sits Southwest of the stoplight at Th Tesabarn 8. Minibuses from Bangkok’s Victory Monument are a little faster, a little more expensive, and don’t tend to leave until full. Minivans from Bangkok depart every hour from 5am to 9pm, taking about two and a half hours. From Pak Chong, they depart from outside Tae-Wa-Da Plaza near the giraffe statue or the terminal mentioned above. Some sources say the last minibus leaves at 7pm, others claim 9pm. The cost is around 160-250 baht. If you’re heading in the other direction, you may also be able to catch buses to other northeastern destinations such as Buriram, Khon Kaen, Khorat and Ubon Ratchathani from a terminal from an orange building a bit further northeast up Mittraphap Raod. More information can be found here. Renting a car in Bangkok is an option and will save you the hassle of trying to arrange transportation within the park. Renting at either the domestic Don Muang Airport or the international Suvarnabhumi Airport will avoid the worst of Bangkok gridlock and get you right on the highway headed to the park – Don Muang is a tad closer, if you have an equal choice between the two. It’s about a two and a half hour drive, without traffic. Personally I have never driven a car in Thailand, though I may attempt this for a future trip. You can also hire private transfers if you don’t feel comfortable driving yourself, though at great expense. Expect to pay around 2,200 baht one way or 3,200 baht round trip within the same day. 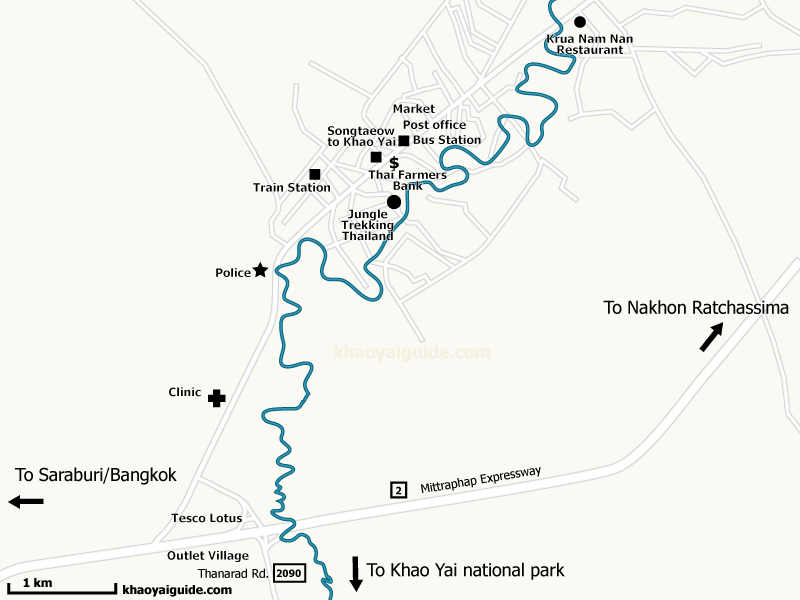 The main issue with visiting Khao Yai independently is that the park is vast and huge, and Pak Chong is 17 miles (27km), or a thirty minute drive, from the park’s Northern gates – and even then, the Visitor Center and the many trails that start there are a further 9 miles (14km) away. So once you’ve gotten yourself to Pak Chong, you still need to get to the park entrance gates, and then to the park’s Visitor Center and around. There are several options for getting into and around the park. The cheapest option is to take a public truck or songthaew from Pak Chong town to the main northern entrance of the park from 6am to 5pm, which costs 40 baht. The trucks departs from the 711 near the giraffe statue east of the night market on the main road, which you can reach on foot from all main public transportation stations. You should also be able to hop onto the songthaew from guesthouses on the main road to the park in Pak Chong and Mu Si. The last songthaew on the way back to Pak Chong from the gates depart around 4pm. When you get to the park entrance gates, you’ll have to hitchhike to the Visitor Center, from which many trails to top attractions within the park begin. Get used to asking for rides if you need to reach the park cabins or camp grounds, or any of the far flung waterfalls. The good news is hitchhiking in the park is fairly easy – the five of us easily found a ride back to the start of a hike along Phakluai Mai trail, where we’d left our bikes, from the Haew Suwat waterfall where our hike concluded. If you plan on hitchhiking extensively, you may wish to visit on the weekends when there will be far more people driving through the park. From Pak Chong, you can also take a taxi all the way to the Visitor Center or to a campground for around 300 baht, but be sure to get the cab driver’s number to arrange for pick up when leaving, and consider negotiating a side-trip to Haew Narok on the way in or out, which is in the deep southern end of the park and will require a ride of some sort or another to see. Once inside the park, you can hire the services of a park ranger for a guided hike for 500 to 1,000 baht (full price list shown below), which will include transportation to the trailhead. This could be a great way to seek out some of the more far-flung trails and waterfalls – and enjoy some added information – if you’re exploring the park on foot. You might even be able to sweet talk them into picking you up at the entrance gate upon arrival by calling ahead, or into dropping you off on your way out. A final option? At the Visitor Center, I was excited to see bicycles for rent for 50B per hour – and I’m sure you could negotiate a long term rate. This is another great alternative for those who prefer to forgo motorized transportation. One intriguing option is to combine taking a tour with some independent exploration of the park. Sign up for a day tour in Pak Chong with a company like Greenleaf Guesthouse or Bobby’s Jungle Tours, and arrange so that they leave you in the park at the conclusion of the your tour, and pick you back up at the end of another tour a set amount of days later. If you sign up for both a half day and full day tour, both these companies will also pick you up and drop you off at the bus and train stations as well. This will give you the benefits of getting to and from public transportation easily, getting to and from the Visitor Center conveniently, and giving you some guided and some free time in the park. Skip ahead to read more about Tours available in Khao Yai National Park. If you didn’t rent a car in Bangkok but are hoping to get around in one, your options are limited, however I’ve read that cars may be rented for 1,500 baht per day at Rimtarninn Hotel, however my calls to attempt to confirm this were not successful. If you want to try it for yourself, take a passport and international driver’s license. Don’t want to be behind the wheel? Reportedly, for 1,500 baht, you can hire a taxi for the full day from Pak Chong. In my opinion, the very best option! This is how I explored Khao Yai National Park. Motorbikes can be rented in Pak Chong town for 300 baht per twenty-four hours, with extra helmets available for 50 baht per twenty-four helmets (one bike includes one helmet). We had hoped to rent manual motorbikes, but rented from Honda, where only automatic motorbikes were available. If anyone has information about the selection of Petch Motor or at Thai Yen Co Ltd, hit me up! Honda’s hours are 8:00am to 5:00pm Monday through Saturday, 8:00am to noon on Sundays. It is an easy fifteen minute walk from the train station and even closer to the bus terminal we used to head back to Bangkok after. Remember that you must return with the tank full. In case of flat tire, there is a 500 baht pickup charge to switch out the motorbike, plus the cost of any damage to the bike. Getting to the park entrance from Pak Chong can be intimidating. At one point you’re on a four line highway with tankers passing, so it’s a good idea to have some comfort level on a bike before arriving. Once inside the park, grab a map from the visitor’s center. Google Maps showed the roads but had limited labeling, and it didn’t correspond to park maps and phone service was limited so don’t rely on it. Park maps and signage will get you where you need to go. Once inside the park, petrol is for sale at Haew Narok for 70 baht per liter. Better to fill up at the visitor center where it’s 50 baht per liter and of better quality. Overall, the roads within the park were fantastic. One exception? The road to Pha Diew Die Viewpoint could use a little love, so drive with caution on that one. There is a 60kph speed limit in the park and numerous speed bumps to enforce it. Animals – mainly monkeys, though elephants can be an issue too – like to hang on the side of the road, so please drive with caution, and consider these safe driving tips. Allegedly there is a motorbike rental stand near the entrance to the park for 600 baht/day but I did not see it during my visit (though I wasn’t looking). For those choosing to stay outside the park, there are many, many options, particularly along Thanarat Road — which shoots directly from Pak Chong down to Mu Si and the Khao Yai gates. Some may be accessible via the public songthaew from Pak Chong to Khao Yai, others may require a taxi. If you are staying outside the park and especially if you book tours with your accommodation, many places will pick you up at the train or bus station. You can explore options here on Agoda, my favorite site for booking accommodation in Southeast Asia. However, I strongly encourage you to sleep inside the park. You’ll be able to visit on multiple days without paying multiple entry fees, you’ll have access to the trails in the early morning and at sunset, when wildlife is most active, and you’ll get to truly immerse yourself in the beauty of this enormous national park! That said, it won’t be easy. There are no hotels within the park, just simple campsites and basic cabins. If you plan on camping in a tent, prior reservations are likely not needed – though I encourage you to avoid weekends and holidays, when the campsites reportedly take on a more party-like atmosphere among Thai students. There are two campgrounds available, Lam Takong and Pha Kluai Mai. If you have your own camping supplies, you’ll need to pay just 30 baht to pitch your tent. If you’re renting, tents for three people (225 baht), tents for two people: (150 baht), sleeping bags (50 baht), and sleeping pads (35 baht) are available — fees quoted are accurate as of January 2016. You can find a map of the park’s campsites handed out at the Visitor Center here, and see some photos here. You can make reservations as early as sixty days ahead, and for a maximum of three nights. You can check availability here, though the tool is only partially in English. Cabins of various sizes for a capacity of two to thirty people are available in four zones: zone one is closest to the visitor center and thus best for those without transportation, zone two offers six and eight person bungalows with scenic views and zone three is set along a vast field. Zone four, also know as the Thanarot Zone, is in the southern portion of the park. Cabin prices range from 560-2,100 baht (800-3,000 on the weekends). We stayed in Bungalow 205 in zone two, though next time I’d book Bungalow 206 for the best view. The two bedroom, two bathroom cabin was equipped with six hard beds, six glass bottles of water, an electric kettle, charging outlets, no fridge or cooking facilities (we were unclear if these were available elsewhere in the campgrounds), flush western toilets, no toilet paper, and alleged hot water showers that actually were cold. Now for the hard part: making reservations. You can do so here through the National Park’s website, but payment will be tricky. Credit cards aren’t accepted; you’ll have to pay via online bank transfer or in person at a Krung Thai Bank within forty hours of booking (you’ll receive confusing directions upon making your booking). As I do not have a Thai bank account, I gave cash to a friend who did and they made the transfer for me. I assume this won’t be an option for most, which leaves you with the choices of making an international bank transfer, going in person to a Krung Thai Bank once you’ve landed in Thailand, or asking a particularly helpful staff person at a Thai hotel or travel agency you’ve booked to do the transfer for you and add the total to your bill. After, be sure to email The Department of National Parks at np_income@dnp.go.th with your payment receipt and your booking code. It is a huge inconvenience, but I do think it was worthwhile! Other tips? Checkout is at noon. If you are camping in a tent, make sure your food is secure as animals are notorious for breaking in. Allegedly, there is sporadically working wifi in the Visitor Center, but we never tried to use it. There’s a left luggage room in the Visitor Center if you want to explore before check-in or after check-out. Good luck! In Pak Chong and Mu Si, there is a seemingly endless array of bizarre places to eat. We had lunch at alien-themed Galaxy 17 and dinner at European palace-inspired Midwinter Green. Both were expensive by Thai standards but quite a unique experience. The cheapest options would be eating at roadside stalls without English signage or at budget guesthouses like Greenleaf or Bobby’s. If you’re stocking up on snacks before heading in to the park, there’s both a mini Tesco Lotus and a 7-Eleven along Thanarat Road on the way from Pak Chong to the northern gates. Within the park, simple Thai food is widely available, though cafes close early. Across from the visitor center at the main “restaurant,” there’s no table service, but rather several food stalls where visitors can order a variety of Thai food and drinks. There’s also a convenience store that sells snacks, and basic necessities like soap, insect repellant, and toilet paper. Everything closes up by 6pm, so plan accordingly! There are also small restaurants at both the Lam Tha Kong and Pha Kluai Mai campsites – we had lunch at the latter, as we read the former is not regularly open. Other options include small restaurants at Haew Narok and Haew Suwat Waterfalls, a small restaurant and convenience store at Thanarot / Zone 4 lodging, and a café at the turnoff from the main road on the way to Haew Suwat. All offer simple Thai dishes like curries and stir fries for just 30-40B per item, and are typically open from 8:00am to 4:00pm. Khao Yai is a hiker’s paradise! There are several outdated park maps floating around online, some of which include trails that the park no longer maintains. Here is the updated map currently being handed out by park officials of the six trails they are currently promoting, and here is the park’s descriptions of those trails. 1 – A simple 1.2km loop around the Visitor Center taking an estimated one hour. I wish we’d done it! There’s a resident family of gibbons that hangs around in the morning and it’s purportedly great for birding. Guide not required. 2 – A 3km one-way hike that takes an estimated two hours. Read about my experience! Guide not required, though be prepared to hitchhike back to the starting point. 3 – A 3.3km, two hour hike to the Nong Pak Chi wildlife observation tower. The tower overlooks a small pond and salt lick, and offers great chances of seeing elephants at dawn and dusk. A park ranger guide is recommended at the rate of 500 baht per group. 4 – An easy 2.7km trail to the reservoir, taking an estimated hour and a half. Supposedly great for birding. A park ranger guide is recommended at the rate of 500 baht per group. 5 – Another trail to Nong Pak Chi, this one leaving from the Visitor Center and taking three hours over 5km. A park ranger guide is recommended at the rate of 700 baht per group. Can be combined with hike #3. 6 – A five hour, 8km trek to Haew Suwat waterfall from the Visitor Center, passing several other falls along the way. A park ranger guide is recommended at the rate of 1000 baht per group. Bicycles are available for rent for 50 baht per hour from the Visitor Center. Khao Yai is bursting with waterfalls – forty four of them, according to some sources! The most popular are Haew Narok, the largest in the park and located near the southern entrance, and Haew Suwat, made popular by the movie The Beach and located in the east of the park. Swimming is not allowed at any of the park’s waterfalls. Haew Narok is reached via a .6 mile (1 km) each way, stair-heavy footpath from the car park, while Haew Suwat is reached via a .125 miles (200m) each way path from the car park. The next two most popular are Kong Kaeol Waterfall, reached by hike #1 around the Visitor Center, and Pha Kluai Mai Waterfall, reached by hike #2. Other sights include the Nam Pak Chi observation tower, which can be reached from the hikes outlined above or from an easy .5 mile (900m) walk from the main road, a path that begins a short 1.1 mile (1.8 km) drive north of the Visitor Center. Two viewpoints we visited included a overlook at the 30km mark after entering the park’s northern entrance, and the Pha Diew Die Viewpoint, reached via a raised .2 mile (300 meter) walkway. There are also spirit houses right next to the northern entrance gates and en route to the Pha Diew Die Viewpoint that are worth a look. Don’t miss the Visitor Center, which is not just a source of information and maps but an impressive museum in its own right. Remember there are no guarantees in National Park full of wild animals, so don’t get your heart too set on seeing a specific species! Unfortunately, we didn’t spot elephants – but by the time we left we had seen a crocodile, countless deer, a big horned stag, two types of monkeys, snakes, field mice, crazy bugs, porcupine, and my favorite, a common palm civet! Elephants? What elephants? The best way to see animals is to hire the services of a park ranger, go trekking at dawn and dusk, take a night safari, and hang around the campgrounds. You can find a full list of the species spotted in the park here. Think the party is over when the sun goes down? It’s just getting started! National Park-hosted safaris are available nightly at 7pm and 8pm, and last around one hour. Read about my experience. A must do, and a bargain at 500 baht for the truck – so for our group of five, we paid just 100 baht each. Allegedly on Saturdays you can pay 50 baht to join a vehicle rather than renting the whole thing. Those staying outside the park are able to take the 7pm time slot. Apparently, whitewater rafting trips are available to book at the Visitor Center. I’m going to look into this on my next trip! Read more here and here. Yes, this is a guide for doing it independently, but it’s good to be aware of the tour options available within and around Khao Yai National Park, in case you decide that DIYing seems a little much. The two standards tours on offers from hotels and travel agencies around Pak Chong are a half day tour that stays on the outskirts of the park and takes in a cold spring, a Buddha cave, and millions of bats emerging from a cave (see my review of this tour), and a full day tour that goes into the park and takes in wildlife viewing, waterfalls, and a nature trek. At budget favorites Greenleaf Guesthouse and Bobby’s Jungle Tours, the prices are 500 baht for a half day, 1,300 baht for a full day, and both for 1,500 baht. Similar tours are available at higher prices from other hotels and travel agencies. As stated above, you may wish to combine these tours with a few nights of independent exploration in the park! I also looked into overnight expedition-like tours with both Khao Yai and Beyond, which offers bush camping in remote areas of the park, and Ton Tan Travel, which offers private tours with the option to stay overnight in the park for free. However, I can’t vouch for either of these companies as I haven’t used them personally — I’d love to hear from anyone who has! Pack a sweater – you’re in the mountains (up to 1351 above sea level!) It was 16C/60F overnight when we were there. Dress well for hitchhiking – Thais are conservative and neatly dressed even in a National Park. You’ll have better luck catching a ride with them if you’re not shirtless and sloppy. Don’t feed the animals. Duh, though we did see deer being fed. Signs everywhere warn not to, and some threaten 500 baht fines for doing so. Feeding by the road is especially dangerous, as it encourages behavior that could lead to accidents. Consider leech socks for longer treks, especially in rainy season. They are sold in the Visitor Center! Think carefully before tackling longer trails without a park ranger. At the end of 2010, a park ranger was lost in the jungle and has never been found, and my guidebook and news reports warned of travelers forced to sleep in the park overnight after braving unruly trails. The ones we took were well marked, but be wary of others! Aim to have reached your destination by at least 3pm, and hire guides for longer treks. It’s never a bad idea to leave a note or message letting someone know what trail you’re taking and what time you plan to be back. First aid is available at the park headquarters, located at the turnoff for the Zone 2 and 3 camping areas. One of the boys in my group stepped on a piece of glass near our cabin and was able to get the wound cleaned and bandaged up there for no charge. If you need more extensive medical care, find a list of nearby clinics and hospitals here. Officially, alcohol is banned in all Thai National Parks. Unofficially, if you enjoy a low-key bottle of wine on the porch of your cabin after a long day – I won’t tell. This is the total breakdown of my two nights, three-day trip cost to Khao Yai. Not included were our first lunch and dinner in Pak Chong, or our transportation to Bangkok from Koh Tao (a ferry, transfer and train package cost 1,228B). Total: 3428B, or $98USD. Not bad for a weekend away! More details on camping fees are available in the Where to Stay section above, and more details on entry fees are available in the Hours, Fees and Contact Information section. We were able to see almost all the park highlights within a full day — and a few quick hours the next morning. However, I would have enjoyed having a second full day in the park to hire a ranger for a longer hike, try the short loop around the visitor center, and to increase our chances of spotting wildlife. Day one: arrive in park, drive to visitor center, enjoy visitor center, do hike #1 around the visitor center, have lunch, then do hike #2 to Haew Suwat. Take a night safari in the evening. Day two: Hire a ranger for an early morning trek around Nong Pak Chi Observation Tower – hike #3 or #5 or both – followed by lunch at the campsite. Drive to the park’s southern highlights (Haew Narok waterfall, Pha Diew Die Viewpoint, spirit house). Day three: Do an early morning hike #4 if you want one last taste of nature before departing. You also may wish to add a night in Mu Si or Pak Chong before or after in order to see the bats of Khao Luk Chang Bat Cave, which sits 3.7 miles (6km) north of the park boundaries. Whenever you can! Khao Yai is accessible year-round. November to February is generally sunny, dry and cool, and a great time for hiking (this is when I visited.) March and April are the hottest time of the year everywhere in Thailand, including Khao Yai – while the high elevation may offer some relief from the heat at sea level, the waterfalls will be at their least impressive. May to October is rainy season, though there are long periods of clear skies, the jungle is lush and green, and waterfalls are at their most wow-able. If you’re visiting from April to October, leech socks are a must. You can stock up in the Visitor Center. Unless you’re planning to hitchhike and will benefit from more people on the roads, avoid weekends and national holidays when the park is filled with domestic tourists escaping the cities. According to one park ranger we chatted to, Thais aren’t big hikers or walkers, so even on a busy weekend when the viewpoints and waterfalls are packed, you’ll have most of the jungle trails to yourself. Another benefit to going midweek is cost, as there is a 30% discount on park lodgings at this time. Looking for a little more inspiration? Don’t forget tot check out my post on my first and second days in the park! The bottom line? Khao Yai is amazing, and you should go whenever and however you’re inspired to! This is one of the longest, most comprehensive guides I’ve ever put together, and I truly hope it helps fill a gap in the available English-language information on traveling to Khao Yai National Park. Have you been? Tell me everything in the comments below! Questions? I’ll do my best to answer. This was such a thorough and detailed post! You must have worked so hard on it. I’m for sure saving it for the future! Alex, what an adventure and a really detailed and helpful post. And such a cheap weekend. Gotta love Thailand for value for money!!! I know! Especially writing this post from the US right now I’m amazed at what a bargain this seems like! Hello, I have been following your blog for a couple months and comparing others to your style and blog format. Awesome job, your hard work shines. BTW I live 50 miles from BRC, and it’s about to kick off, exciting times, too bad for you this year, hope you score tickets next year. You are so kind Michael! Thank you for the kind words. I will be very sad to miss the burn this year, though I do have some exciting other adventures planned 🙂 Next year, I hope! ^.^ Thanks so much for writing this! I have been looking at visiting this park when I have my semester break next month. As someone who has no sense of balance and is still learning to ride a bicycle, it’s great to know I can get around here with just my two legs and a thumb. Oh, please let me know how it goes if you do Lauren! I’d love to hear! Excited to hear the details if you do decide to head here! Good luck! I love getting into the nitty gritty 🙂 And if I get to make a chart? Even better! Wow, I’m flabbergasted by the amount of information you managed to accumulate about this National Park! What an amazing comprehensive guide for anyone wishing to visit! It was never on my radar but you’ve certainly peaked my interest! Hey, they manage to write full guidebooks about the Grand Canyon, so this is tame in comparison 😀 Ha, not but really, I hope this helps those who hope to visit independently! This is an amazing resource you’ve put together! The lack of English language resources can sometimes be a stumbling block for all but the most intrepid of travellers so hopefully this will aid more people in visiting. Friends of mine live in Bangkok and Khao Yai is a favourite getaway when the big city just gets a bit much. I can imagine if I was based in Bangkok this would be a frequent getaway for me! I’d love to return at some point, especially now that the hard part (all the research!) is over. Absolutely incredible post! Thank you for all the detail you put into it. My husband and I are considering the possibility of a second month in Thailand this fall–may need to add this to the itinerary! Ah, please let me know how it goes if you do! I’d love to hear about it! Hey Alex! I was just wondering if you’d considered embedding a pinable image into your posts? I’d love to share some of your posts on Pinterest directly and I know you have a lot of beautiful pins that you’ve created, but I have to find them from digging around on your Pinterest page. Just a suggestion! Great post, and I really want to check out Koh Yai now! Ah yes, I’ve been meaning to do this forever. Thanks for the reminder Richelle! It’s going on my to do list for tomorrow! Alex! I am a new reader and absolutely love your posts regarding Thailand! I am travelling there for a month and was wondering if you have a list of things to bring while im there for a month? Hey Melanie! I actually haven’t done a packing post for Thailand specifically, but you can check out tons of my packing posts here. Hope they help! My husband and I are newbie travel bloggers (we are currently based in San Diego) and really love your work! We are planning on spending a month in Thailand in December, so we have really appreciated your thorough and detailed information about Thailand. It has helped us out quite a bit in our trip planning, especially in regards to diving. Because of you we are spending a few days in Koh Tao. So with that said, I have a kind of random, somewhat unrelated Thailand question. Being travel bloggers we will be traveling with laptop, camera smart phones,etc, and we have had a lot of trouble finding straight information as to whether we need an adapter for Thailand. What are your thoughts? Do you use an adapter there, and if so what type do you use? Hey Jenn! You may occasionally need an adaptor to fit your three-prong laptop charger into two-prong outlets. But that’s it! And you can pick them up for about 50 baht a pop on Khao San Road when you arrive 🙂 Enjoy! Wow, what a great post, thank you for sharing! If I make it back to Thailand, would love to tackle some of the country west of Bangkok! Also, we are big walkers and didn’t mind walking places. Whenever we would ask a Thai person if we could walk somewhere, they would laugh and say take a taxi, it would take 2 hours to get there on foot. We would walk anyway and get there easily in 40 minutes. Thai people definitely don’t like to walk, and I appreciated the reference in your post about most trails being void of people. Ha, I have the same experience whenever I’m in Vegas. Every concierge looks at me with absolute horror when I saw I’m going to walk anywhere! Great to hear about your car rental experience being positive, too. The nice thing about renting from either Bangkok airport is they are pretty far outside the city center so you avoid a lot of the urban craziness. Thank you so much for this Alex! I just skimmed through for now but it has been on my Thailand list for awhile so I will definitely print it out if & when I finally make it Khao Yai. Hope you love it as much as I did — I want to hear about your trip when you go! When i had been to Thailand on my holiday my tour operator suggested me to visit Khao Yai National park. But due to my tight schedule i didn’t visit the national park. But i am regretting now after reading this post. I just finished a tour in Khao Yai in the various themed resorts in just 1.5 days. Contact PUN in 0930722246 to arrange your own tour. She drives a Toyota Vios and her daily charge is dirt cheap! (And she speaks english too! *something relatively rare in Thailand*) Disclaimer: I am not related to her in any manner, just helping out and felt it’s a waste to not avail of her top notch service. Am planning to visit the National Park with my family soon and I’m really happy to stumble upon your guide. Really helpful and gives me a better idea on how to plan our trip to Khao Yai. (1) You mentioned that if you get a full-day tour, they will pick you up at the station–is the station you are referring to the Pak Chong station where the buses from Mo Chit will drop you off? (2) For the minivan option, will it drop you off at the same place as the buses? So glad to hear that Hilary! To answer your questions (1) yes, with the full day tour you can get picked up at either the bus drop off or train station, they are super close. And (2) the minivan and bus drop offs and pick ups are at slightly different places in town, but all are within easy walking distance. It’s a little confusing — I certainly was! — but easy to ask around! Enjoy your trip! Hello, I was looking into trying to take a day trip out of Bangkok to see some beautiful nature. Do you think Khao Yai is doable as a day trip from the city? Hey Laura! I do. I think a lot of people do it as such. We LOVED camping in the park but if you only have a day, that’s better than nothing! Enjoy! Hi, I have lived in Bangkok since July and will finally get to Khao Yai in a couple weeks. I have researched a lot, and your articles on it are the best! Thank you so much! Hey Nicole! That is so flattering to hear! Thank you very much 🙂 Let me know how you like Khao Yai! Hi! I was trying so hard to find information on how to navigate Khao yai national park when I stumbled on your blog! Thanks for the excellent information! I wish to take up you suggestion to book bungalow 206 – but wonder if you could help me by sharing whether it is still walking or cycling distance to the visitor centre? We don’t have transport, and intend to book a green leaf day tour. But was worried we can’t get to the visitor centre to be part of the tour! Hey Yihui! So glad you found this post helpful. Unfortunately, I don’t think 206 is a great choice if you don’t have your own transport… it’s really far from the visitor’s center and all food options. I’m a really terrible estimator (literally one of my greatest weaknesses, lol) but I think it would be uncomfortably far on foot, maybe do-able on a bike but not ideal unless you’re a strong biker. Let me know how your trip goes! I’d love to hear about it! My partner and I just spent 3 fantastic days in Khao Yai. I remember the night time when we went for quiet walks in moonlight. The air was cool and calm, and the night sky above was a tapestry of stars. It was just magical. Here are some notes I’d like to share. We stayed in the park from Tues to Thurs to avoid the weekend crowds. It was great. There were few visitors and we basically had the hiking trails to ourselves. The downside is that we had limited food choices as only 2 food stalls in the restaurant opposite the visitor centre were open. We went in the beginning of March. To be honest it wasn’t really the ideal time to visit as it was the dry season. The earth was dry, vegetation not lush and the waterfalls had little water. In the afternoon it got too hot to hike as well. I suppose it would have been better to visit in the cooler Nov-Jan period after the vegetation has recovered during the rainy season. Sun 6.00 pm bike returns only, no rental. For accommodation we wanted to book a cabin for two in zone 4 (cabins 407/1 to 407/5 have ensuite bathroom, 407/6 to 407/9 shared bathroom). As you mentioned, the payment by wire transfer is complicated. I didn’t have access to a Thai bank so I decided we could just arrive at the park and get one on the spot. I checked the cabin availability on http://nps.dnp.go.th/reservation.php?option=home (click on the UK flag top right and Reservation > Available calendar) and the 407 cabins were available. But 2 days prior to our arrival, they were all suddenly booked! Our hearts sank when we saw the “No rooms available” sign at the counter. I was even prepared to get a pricier bungalow for 4 (around THB1200 I think) but the lady at the counter then made a phone call and said that cabin 301/9 (two beds and ensuite bathroom) was available at THB 560 (THB 800 – 30% discount). We took it straight away. It’s located in Zone 3 about 3 km from the visitor centre. Zone 3 houses a dormitory complex for school children – there was a big group when we stayed there. There are 10 cabins from 301/1 to 301/10. The teachers stayed in the cabins beside us. In fact only 4 or 5 cabins were occupied. The rest were empty. I found out later that on the website they list the Zone 3 dormitory but not the 301 cabins. So if you happen to be stuck for accommodation, ask for the 301 cabins and you may just get one if they’re available. Petrol is available at the guard house (“Patrol Guard” on the map) 500m south of the visitor centre. THB40 per bottle. Hey John! Thank you SO MUCH for these super detailed trip notes — I’m sure they will be awesomely helpful for another traveler! Good to know they have cars available at Honda. I copied the hours in this post from our bike receipt so I wonder if they have changed since my visit. Also great intel on the 301 cabins! Sounds like you had a great trip. Such a great post! Helping to plan my trip here inthree weeks time! ? Thank you for posting this! ? Yay! So happy to hear this guide is getting used by fellow nature-lovers 🙂 Enjoy, and report back if you feel inspired! Yay! Comments like this make me super happy. This is exactly what I was hoping for when I created this resource. Have fun Georgia! Hi Alex! Thanks for the great write up on the national park, it’s very helpful. Do you know if we can hire the park rangers when we are there only or do we need to do it in advance? Hey Cheryl! I think you just do it when you’re there — I’m not sure how easy it would be to arrange in advance with the language barrier working against you. Wow, very impressive write up! Planning a trip with my friends and good that I came across this blog. Thank you so much for the very detailed info, will share as well! You’re so welcome Cel! This park can be hard to find reliable info on but it is SO worth a trip! Hey Kevin! Unfortunately I can’t quite recall. My impulse is to say no since being asked to show a license is almost unheard of in Thailand but this place is more official than most. If so, we only had car licenses from the US to show — nothing international or with motorcycle privileges. Hope that helps and sorry I’m not more confident in my answer! Hi Alex, I read through your blog and feel so compelled to drop you a thank you note, for the effort in doing this all in the name of helping independent travellers. I am in the midst of researching for waterfalls to visit (request/demand from my 8 year old), and Khao Yai is definitely a place that we may go. My silly question, no swimming allowed in the waterfalls? Really? Please answer this! Regarding driving in Thailand, my personal experience is that it is very safe, clear signage and with Google Maps, pretty straightforward. I (from Singapore, also right hand drive) have rented cars from Bangkok, driven to Pattaya and Chon Buri. Hey Andy! You are so welcome — that means a lot. Unfortunately the no swimming is true. There are some freshwater crocs (or alligators? can’t remember…) in the area and so they have banned all swimming. That’s great to hear about the driving. One of these days I will tackle my fear of renting a car in Thailand and go for it! Hey Vikram! With a 15 month old I assume you wouldn’t really be taking on any of the serious hikes but if you guys have a comfortable carrier I think you’d be more than capable of doing the walk to the salt lick and any of the waterfalls that I visited. The visitor’s center and some of the viewpoints would round out the trip. You’ll likely see plenty of wildlife along the way. Enjoy! A little worried about getting around Khao Yai / from Pak Chong to Khao Yai. Just wanted to confirm that there are indeed taxis in Pak Chong that will take me to my hotel? Hey Isabelle! There are, but it might be best to have your hotel pick you up if you aren’t planning on renting a car or bike. How do you plan to get around the park? Hi! Just wondering the motorbike you guy’s rented can fit 3 people on it? One at the front perhaps? Well, I’m sure Thai people do it all time 🙂 But I definitely wouldn’t recommend it for driving around the park — I don’t think you’d by very comfortable. Just wondering are there taxi available in Pak Chong that can take us to hotels? Hey Jerrick! I believe there are taxis, but it might be best to have your hotel pick you up if you aren’t planning on renting a car or bike right around the station. How do you plan to get around the park? Hello Alex! Thanks for the comprehensive post! It really aided my planning for a Khao Yai trip sometime this December. I have a question, is there UBER in Khao Yai? Good question Swan! I’m not sure — let me know if you find out though so I can update this post! Firstly, I’d like to say you’re an awesome blogger! I have been Khao Yai last year but I didn’t stay overnight at park. And now I’m planning to make a camp at there and I found your review luckily. Noted missing place I haven’t been last year. Thanks so much! May I know your review of any other place in Thailand? If you already have, can you show me the link? Hey Iris! So glad you enjoyed this coverage of Khao Yai. You can find a list of all the cities, islands and parks I’ve covered in Thailand on my destinations page right here: https://www.alexinwanderland.com/destinations/. Hope you enjoy! thanks a lot for your article! I have been looking for similar information for weeks! I have some additional questions if you don’t mind. First, we are wondering if there is any place between Pat Chong and the park where we can drop our luggage for the day, as we won’t spend any night in the park but we will arrive from BKK and leaving for Ayuthaya in the evening. Also, should we arrive at the visitor center around 9/10, might it still be possible to find a ranger for a tour? Hi Irene! Honestly, I’m not sure about the luggage. We didn’t find any left luggage at the train station and that is normally the go-to. You might drop by the guest house where we stayed our first night outside the park, have breakfast or lunch in their restaurant, and ask if they’d be willing to store it for a small fee. Good luck! Thanks a lot for this great article and all the tips! I will visit Khao Yai with my family in August. I am looking forward to it. Have you eventually heard from “Khao Yai and Beyond”, the tour organiser mentioned in your article? Are they recommended? Hi Martin! I have emailed with them about various parks in Thailand and they are super responsive by email which is rare in Thailand 🙂 However I have not taken a tour with them. Let me know how it goes if you do! Thank you so much for all the info ! How do you book the night safari ? Hey there! We booked it upon arrival in the park. They told us about the details in the visitors center, and then later I called them from our cabin and booked it via my Thai cell. I usually ignore long posts about trips but this was truly amazing! You must’ve had a great time. This is what I’ve planned from the post. Planning to visit from Bangkok early Jan, take the early morning train. Arrive in Pak Chong and rent a bike from Honda. Take a trip early morning next day and return back to Bangkok by the Afternoon. 1) Were you able to access your bike everywhere during your visit in the park? Hey Hasher! Sounds like you have an awesome itinerary planned — that’s what we did and while I always wish for more time, it was a great trip. We were able to drive all roads in the park with the motorbike that you’d be able to drive with a car — did I understand that question correctly? Have the best time! Thank you so much for posting about this! I am having a hard time looking for detailed Khao Yai itinerary. I just want to ask if you entrusted your passport to Honda. I am having doubts in doing so. Also, is Honda near the Bloom by TV Pool? I cannot tour the National Park due to time constraints but will definitely visit the restaurants and farms, is renting a motorbike a good idea for this? Hey Denielle, the Honda was very trustworthy and professional and while I generally don’t like leaving my passport anywhere out of my possession, I felt reasonably comfortable doing so. Apologies I don’t know about the location you asked about. A bike is a great way to see any part of the Khao Yai region, but really, the National Park is the star! I’d rearrange if possible, so you can go there. Its an amazing post! We are on our way to the park, and we were not able to do that without your help.thank you !!! This makes me so happy to read! 🙂 Hope you have as great a trip as I did! Enjoy! First off this is a fantastic guide considering the lack of information out there! Me and my partner are considering renting a bike but wanted to know if they’re scooter bikes or proper motorbikes? Since we will have a large camera backpack a proper motorbike won’t be possible and we’ll have to go on foot. If we have to go on foot do you have suggestions on the best way to see the southern attractions? Hey Lara! To my memory, they were scooter style. But honestly, if you have a huge bag, going on foot really won’t be very feasible either due to the huge distances to, from, and around the park. In that case I think you’d have no choice but to hire taxis and possibly park ranger guides, as well. Wow amazing thank you so much for putting all of this information together! I just had a quick question. For Hike #2 and Hike #6 I noticed these are both hikes to the Haew Suwat waterfall but have different distances. Are they just different trails/pathways which lead to the same place? Yup, exactly! If you click the map that’s linked to in the text, you can see the different routes. What a comprehensive post. Love reading this and will refer again before I visit. Thanks so much Alex x. Thank you Dory! I tried to create the guide I wished I could have read before visiting! Thank you so much for this great post! Due to you we are planning on going to the Np in March. However I still have a question. First if you have any news on hiring a car in Pak Chong? I wrote to the adress that you give but I have not yet gotten a response. My second question is if you know if it is possible to get from Lopburi to Pak Chong by Bus? Without having to go back to Ayutthaya? Hey Isi! I’m so glad to hear that! I love hearing about people exploring Thailand National Parks. I’m sorry to report I still haven’t heard from anyone who has successfully rented a car in Pak Chong. Please keep me updated if you hear back! Also, I do believe that you will have to go to Ayutthaya first, however please keep me updated on that as well. So sorry I couldn’t give you any further details! Thanks for the usfull guide! Another important information you can add is that it is possible to storage luggage at the visitor center while visiting the park. Yes indeed! I thought I had mentioned that (as we stored some luggage there) but perhaps I forgot. So helpful!